When experiencing issues with call quality, isolating the type of issue being experienced can help identify the resolution as well. If you need any additional assistance, please contact our Customer Support team. If call audio is cutting in and out, sounds robotic (pixelation), or is delayed; the issue is most likely a result of poor network stability. LAN congestion/delay leading to dropped packets (jitter). Lack of bandwidth/unable to support simultaneous calls. Test your connection to verify your network meets the requirements needed for VoIP. Contact your ISP for any performance related issues. Increase ISP bandwidth as needed. Implement QoS to reduce LAN congestion and ensure the WAN connection handoff (egress) is not saturated. Static heard in the audio is typically caused by a physical connection issue. Loose cable connections in the phone, handset, or wall-jack. Re-seat cabling (unplug and re-plug) and replace any bad cabling. Try a known working phone or handset to identify malfunctioning hardware. Replace any hardware as needed. Try a different physical location to rule out EMI issues. Echoing occurs when audio is both loud and delayed. From an audio perspective, most phone calls are loud. When using an internet connection to place those calls there is a higher risk of audio being delayed—though you do not typically notice. 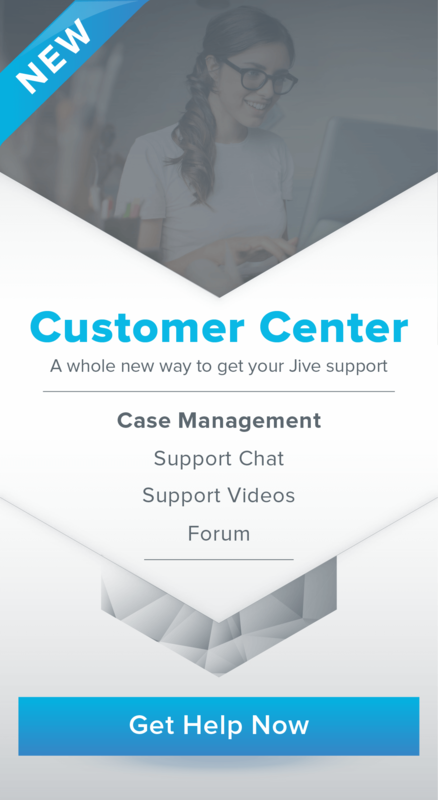 Jive uses echo cancellation so that most calls do not experience echoing. However, If there are still issues, it means that the audio is either too loud or too delayed (or both). Combination of volume setting and delayed sound. Lower speaker volume or decrease microphone input gain (sensitivity).